A leading brand of home and garden pest-control products says it will stop using a class of pesticides linked to the decline of bees. 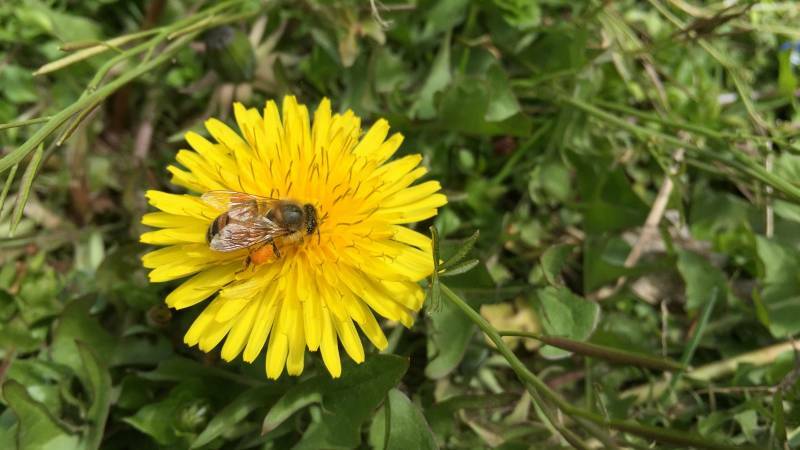 Ortho, part of the Miracle-Gro family, says the decision to drop the use of the chemicals—called neonicotinoids, or neonics for short—comes after considering the range of possible threats to bees and other pollinators. "While agencies in the U.S. are still evaluating the overall impact of neonics on pollinator populations, it's time for Ortho to move on," says Tim Martin, the general manager of the Ortho Brand. The announcement comes on the heels of state legislation passed by the Maryland General Assembly to restrict the sales of retail home and garden products that contain neonics. The bill is now before Gov. Larry Hogan; his office tells us that he is currently reviewing it. Other states are also studying pollinator health and considering action, according to the National Conference of State Legislatures. As we've reported, neonics are widely used in agriculture. Currently, at the direction of the Obama administration, the Environmental Protection Agency is assessing the effect of neonicotinoid insecticides on the health of bees. A growing body of scientific evidence suggests that neonics can negatively influence bee health and may make bees more vulnerable to mites and other threats. Now, the amount of neonics used in home lawn-and-garden products is dwarfed by what farmers use on crops. But Delegate Anne Healey of Maryland, a sponsor of the Pollinator Protection Act, says it's still important to take action. "I'm hoping this [legislation] will raise awareness" of the decline of pollinators, Healey told us. "In Maryland we experienced a 60 percent loss in bee colonies in one year," Healey says. Although the beekeepers have been able to rebuild their colonies, "overall, it's clearly a problem." As we've reported, there are a host of issues linked to pollinator decline — from a loss of foraging habitat to the varroa mite to climate change. And neonics manufacturers, such as Bayer Crop Science, have focused on efforts such as planting more wildflowers and rebuilding habitat where bees and pollinators can eat. The industry maintains that the products it manufactures are safe for bees both in agriculture and in home and garden settings. "The products that contain neonicotinoids are safe for use by homeowners and professionals," says Karen Reardon of RISE, a trade association that represents manufacturers, formulators and distributors of specialty pesticides. Ortho has already begun to phase out neonics. The company tells us that some products will be reformulated or discontinued by 2017. The company says it will complete its phaseout of neonics in outdoor products by 2021.